The aim of this WG is to investigate (i) the mechanisms ofubiquitylation, SUMOylation and modifications by other Ub-like proteins, (ii) the crosstalks of factors involved in protein modification under basal and stress conditions, (iii) the post-modification mechanisms responsible for the physiopathological properties of the targeted proteins, (iv) the structural bases of protein recognition and (v) the characterization of Ub- or Ub-like receptors involved in the processes under investigation. This WG aims to understand (i) proteasome biogenesis and regulation, (ii) the molecular mechanisms controlling autophagy and (iii) the Ub-dependent and -independent processes regulating programmed cell-death/apoptosis. This WG addresses (i) the regulation of signalling cascades under basal and stress conditions, (ii) the intracellular traffic of modified proteins and the identification of factors regulating these mechanisms in physiological and pathological situations, and (iv) the molecular mechanisms regulating transcription. This WG investigates (i) the regulation of protein folding in physiology and pathology, (ii) the molecular mechanisms controlling the ERAD pathway and (iii) the functional characterization of chaperones involved in protein quality control. 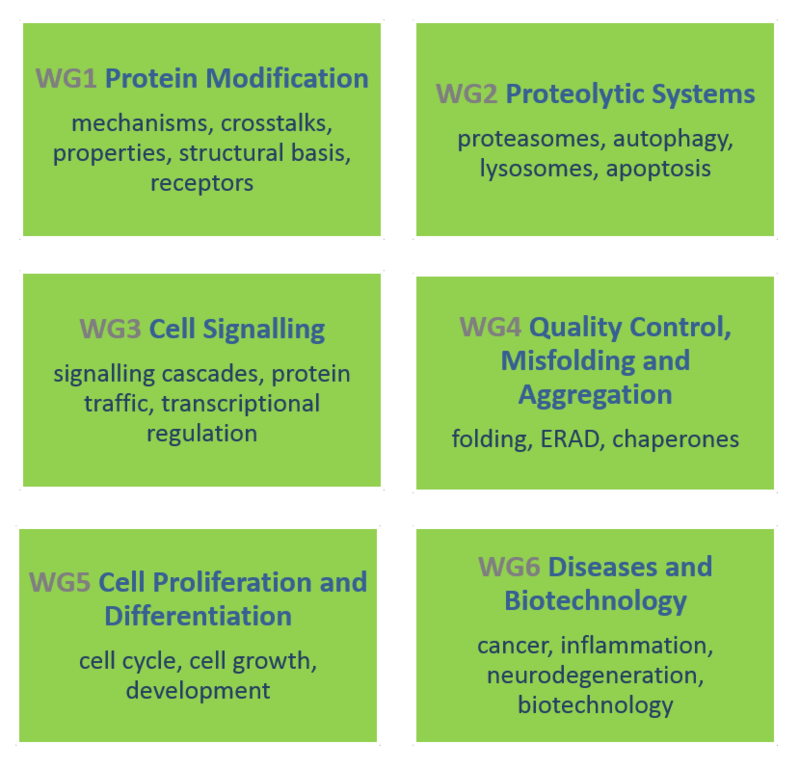 This WG studies (i) the regulation of proteolysis during the cell cycle and (ii) the gene products regulating essential cellular processes during cell growth and differentiation. This WG (i) addresses issues connected to disease understanding, diagnosis and treatment, with an emphasis on cancer and immune and neurological disorders, and (ii) deals with biotechnology challenges involving protein engineering, and plant and animal breeding.